Nature isn’t always going to cooperate with you. Plain and simple. Sometimes she has her own ideas of what she wants to do and there’s nothing that’s going to stop her. There are things that you can do to slow down the inevitable (and maybe even stop it), though. We talked about soil erosion and how to prevent it a couple of weeks ago. Building a retaining wall is one of the best ways to prevent soil erosion, but it has benefits and advantages that go beyond just its practical use. Aesthetics – While there’s something to be said for rolling hills and slopes, they’re not so nice in your backyard most of the time. Retaining walls can help break the monotony and bring a more clean and refined look to your landscaping. There are many options concerning materials that you can use for retaining walls. They can be built to complement the rest of your landscaping and your home, as well, so that you’ve got a gorgeous cohesive added element to your yard. Planting – The roots of plants help to keep soil in its place, so it’s only natural that you would add plants to your retaining wall. 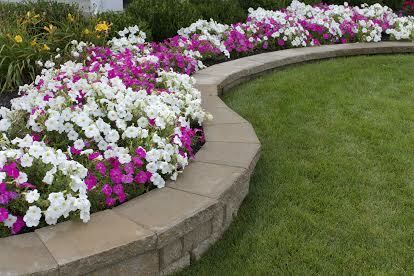 Turning the retaining wall into a nice planter will add color and dimension to your landscaping. You can even us perennial flowers that will grow back on their own year after year. Keep your planter/retaining wall weed free and watered to make sure that your flowers bloom beautifully each spring. Add value to your home – The more work that you put into your home, the more it’s going to be worth down the road. Since retaining walls help to prevent soil erosion and flooding, they can even help you keep the value of your home up. Sometimes adding value to your home can be expensive and time consuming. Retaining walls don’t take long to build and are an inexpensive way to add value and practicality to your landscaping. Low Maintenance Landscaping – Once your retaining wall is in, it won’t require much maintenance. You’ll have to do the typical weeding and watering for your plants, but other than that, there’s not much more to be done. If a paver or stone breaks, you may have to replace it, but that’s about as far as your maintenance responsibilities will go. Retaining walls stand up well to harsh weather conditions as well. A retaining wall is the perfect addition to your Maryland landscaping project if you need to contain soil, avoid flooding, or just want a nice stone/paver wall to complement your existing landscaping. When you’re ready to get started with your project, give us a call at 410-768-4720 or contact us via our website today. This entry was posted on Friday, June 27th, 2014	at 5:25 pm	and is filed under Lawn Tips	. You can follow any responses to this entry through the RSS 2.0	feed. Both comments and pings are currently closed.